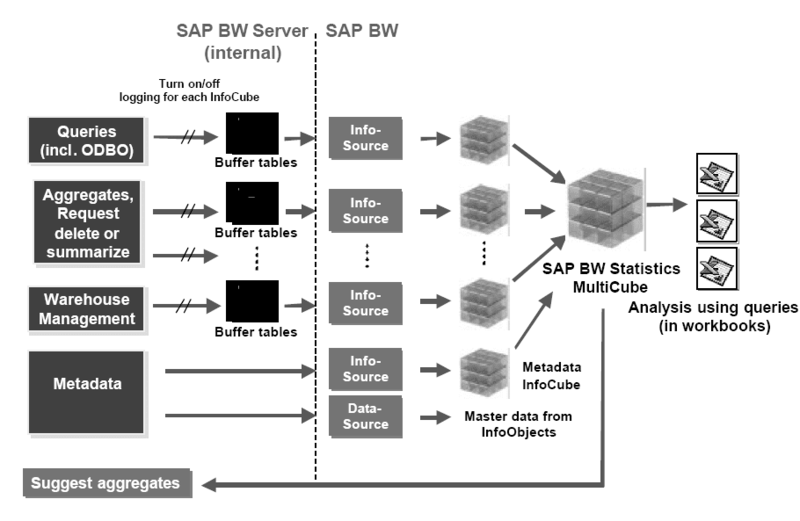 SAP BW persistent staging area PSA Functions has important functions as explained here.In this graphic, data from DataSource A and DataSource B is uploaded into a PSA. The PSA (Persistent Staging Area) corresponds to the ODS in BW Releases prior to 2.0B.The PSA allows you to use transfer rules to upload data into the BW ODS (Operational Data Store). In the graphic, the ODS is displayed as a single level. 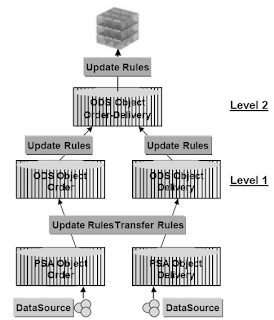 Depending on the business scenario, the BW ODS can also take the form of a structure consisting of several levels. The ODS objects in the inbound level of the BW ODS provide subject-oriented, consolidated, and integrated data that refers to a process that is common to different source systems.Data from the ODS is updated in the appropriate InfoCubes or in other ODS objects. 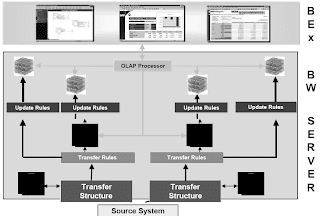 ODS reporting takes place using the OLAP processor or directly using an ODS query. The data in the Persistent Staging Area (PSA) is based on the transfer structure and is not transformed using the transfer rules. The data is system-dependent. Data in the PSA can be either transaction data or master data.In the overall picture, the PSA is the layer of entry in the BW.The PSA supports partitioning to separate the data according to time. 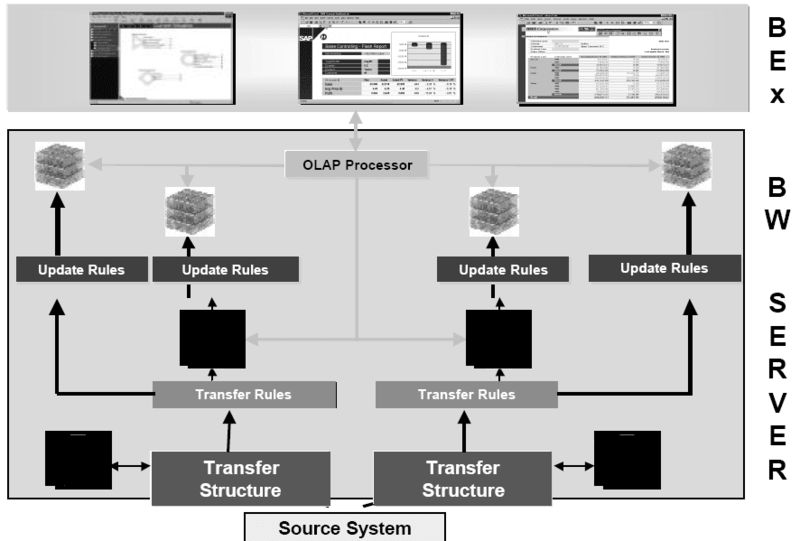 This leads to considerable improvement in the system performance and is also an advantage when you are deleting data from the PSA.The PSA is a transparent table for storing detailed requests in the format of the transfer structure.The PSA is defined per DataSource and source system. It has key fields for the request number, the package number, and the record number. The request number is, however, visible only in the change log. The update of the PSA and the InfoCube can run sequentially or in parallel.When you use tRFCs to transfer data, the number of fields is restricted to a maximum of 255. When you use tRFCs the length of the data records is also restricted to 1962 bytes. Better performance than with data-IDocs. Temporary storage of the data before update in the InfoCube / ODS. Checks and corrects the data if the are errors with the update and validations. Different types of data update. 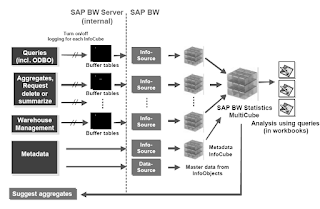 BW statistics provide users with an overview of how InfoCubes, InfoObjects, InfoSources, source systems,queries, and aggregates are used in the system.BW statistics helps you monitor system performance. BW statistics helps users to manage their BW system. BW statistics enables you to get the most use out of aggregates while minimizing the cost of updating them. BW statistics provides you with data on InfoCubes, queries, InfoSources, and aggregates in the Business Information Warehouse. The data in the BW statistics InfoCube is stored and managed in the Business Information Warehouse.When you execute a query, data is entered for the OLAP server and the database, and stored temporarily at the conclusion of each navigation step. The same thing happens if you are using the ODBO (OLE DB for OLAP) interface. Additional data is collected when aggregates are filled or rolled-up, after data has been loaded into Warehouse Management, or metadata is maintained. Although it takes hardly any time to enter and save the BW statistics data, the data set for larger installations can still be quite large. The processes for entering and saving data can therefore be deactivated separately for each InfoCube as well as for OLAP and Warehouse Management.Separate InfoCubes corresponding to the individual InfoSources are filled with data. This reduces the time it takes to stage the data.Reporting takes place using a MultiCube. 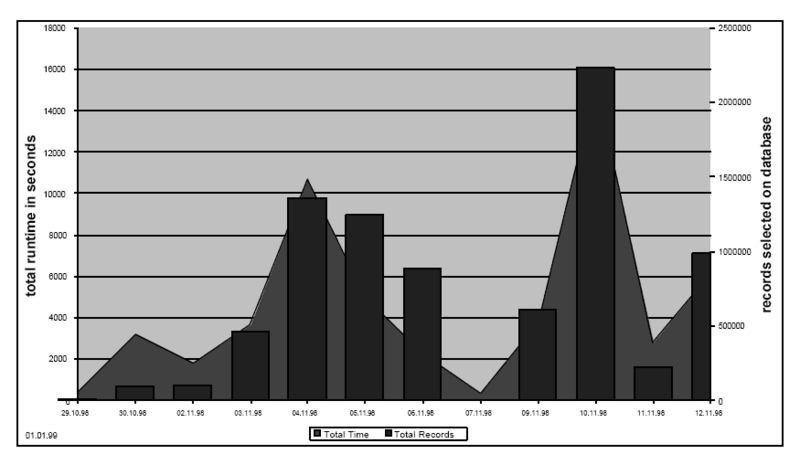 In addition to the InfoCube 0BWTC_C01 and the InfoObjects belonging to it, the BW Statistics workbook including queries and diagrams is also delivered with technical content.The overview of the charts and queries (tables) in the Business Information Warehouse statistics is grouped according to subject-oriented aggregates, OLAP processor (OLAP), and Warehouse Management (WHM). Reports that cover two subject areas are displayed between the headers. The gray pushbuttons represent queries (tables) and the blue pushbuttons represent charts. You use the pushbuttons to call up the query or chart directly. As an example of historical analysis and planning, the total times taken to execute all queries (red area) and the records that are read in the queries (blue horizontal bars) are broken down according to calendar day. Both the absolute values and the relationship between time and records have changed considerably in the specified time period. For example, the two Sundays (1.11 and 8.11) stand out in particular. No data is highlighted, because of the low level of usage. It is difficult to estimate the likely volume of data involved in BW statistics, because it depends to a large extent on how the Business Information Warehouse is used. This table helps you to estimate the volume of data for the statistics data of the OLAP server depending on usage. The amount of data that is retrieved per navigation step is a determining factor in the amount of required memory space. In our example, 1,000 bytes is given as the average size. You adjust this value to your own situation accordingly.The estimated number of users active in the system at any one time is displayed in the columns. The mean number of navigation steps per user per hour is displayed in the rows. In a larger installation where all the data is recorded fully and no data is deleted, you can anticipate several MB of data per day, and an annual data volume of several GB. For this reason, you must consider activating the data recording process for certain InfoCubes only on occasion. 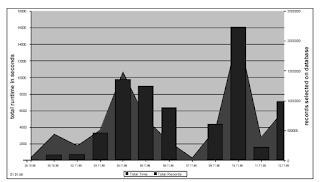 BW statistics are delivered as part of technical content.The procedure for installing technical content is the same procedure that you use to install Business Content.In Business Content there is a role called Technical Content. If you activate the Technical Content role in Business Content, all the required dependent objects for BW statistics are also activated. The Technical Content role in Business Content contains all the objects that you need to implement BW statistics.Since standard InfoSources are provided for BW statistics, the usual data staging procedures are used to load information into the BW statistics InfoCube.